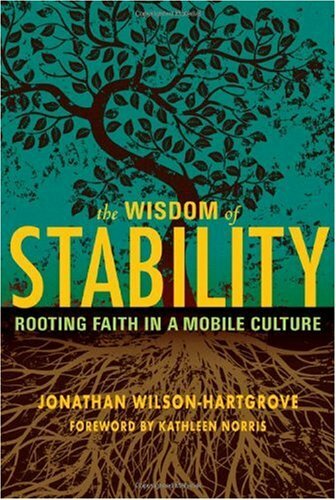 In The Wisdom of Stability: Rooting Faith in a Mobile Culture (Brewster: Paraclete Press, 2010), Jonathan Wilson-Hartgrove seeks to write a book about ‘staying put and paying attention’. In a culture characterised by unprecedented mobility, he believes that ‘the most important thing most of us can do to grow spiritually is to stay in the place where we are’ (p. 1). The author insists that the life of Spirit is, in Rowan Williams’ words, impossible ‘in abstraction from the actual business of living in the body of Christ, living in concrete community. The life of intimacy with God in contemplation is both the fruit and the course of a renewed style of living together’. Or, in Wilson-Hartgrove’s words, ‘Apart from stability in the life of a community, the songs of Zion quickly begin to sound like wishful thinking’ (p. 63). Drawing from the experiences of the monastic fathers and mothers, and from his own journey now as a minister of St. Johns Baptist Church and member of Rutba House, Wilson-Hartgrove properly argues that the practices of stability cannot be ‘reduced to a quick fix for the spiritual anxiety of a placeless people’, and that ‘if our feelings of rootlessness are what drive us to the practice, we’ll need something more than an immediate sense of relief to help us stay’ (pp. 110–11). He turns then to consider three ‘midday demons’ which require resistance if we are to be serious about not being perpetual pot plants but being planted in soil where our roots have room to reach deeper. These are ambition, boredom and vanity. He writes of ambition: ‘ambition tempts us to forsake the mundane for the sake of unlimited growth – or, at least, new opportunities. We are so easily unimpressed by the ordinary, longing for the feeling of excitement that comes with a new task to take up, new people to engage, new challenges to face (p. 114). And of boredom: ‘Whereas ambition pushes us toward perpetual motion, boredom paralyzes, leaving us unable to love our neighbors or even take care of our own basic needs. Though different in character, these midday twins tempt us to the same lack of care. In their grip, it is impossible for us to find joy in community’ (p. 118). And of vanity: ‘Vainglory comes midway along our journey to suggest that all our care is best directed toward self-preservation … Vainglory will try to persuade us that there is nothing more important in the world than our own stability, encouraging us to defend it at all costs against any potential threat’ (pp. 122, 123). There is wisdom in these words, and there’s much to like about the book. Still, I have two reservations about commending it: First, it’s nauseatingly repetitive, yet another example of a standard article-length piece being padded out to make a book. Second, and more substantially, there is, surprisingly, a drift towards an unearthed nostalgia here which works to undermine the author’s basic thesis. (It may be, of course, that my cultural eyeglasses are simply the child of a different prescription to those of Wilson-Hartgrove’s.) Walter Brueggemann once observed of memory that it is that which ‘may be enmeshed in a nostalgic longing for normalcy and “the good old days,” when life was simple and agrarian, settled, and well-ordered. That nostalgia is all intertwined with evangelical memory, so that the nostalgia has a vague religious feeling about it. There is a need to sort out the normative memory from this other vague yearning’. I’m unconvinced that Wilson-Hartgrove (in this volume) succeeds fully in doing the kind of sort out that Brueggemann, rightly to my mind, calls for. moving in materials to build the house. they had no trouble at all. But they all died and this one lived that had such rough treatment. I took the funeral today of a 90+-year-old man whom I have known for twenty-two years. During the past eighteen months I visited him over thirty times, and was with him and his family on the two days of his dying last week. Other folk in my church (in Swansea) I have known a bit longer (I have ministered here for twenty-eight years). I am just beginning to get to know them well, “through all the changing scenes of life”. Thanks for this thoughtful review. In reflecting on the third stage of Ezekiel’s dry bones the other Sunday I thought that ‘having a land’ amounts, for us exilic people to having a place from which to witness. I guess this takes time and a bit of practice in the ‘forgiveness of sins’. Thanks Jason, it is a good poem, and the review is a ripper. As one who had the most stable, steadfast country upbringing – same school, sporting club, church etc. I feel I know what this book is saying. The nostalgia visits often enough, it is true. And I love stable community. That said, I once met a young man who was the son of missionary parents. He’d moved a lot. Yet, he was a steadfast character. He said, ‘I have learned to be at home, wherever I am’! Then… How many refugees are there? How much dislocation in that lot? And Abraham, the man of faith ‘looked forward to the city…’; others ‘desire a better country’. Learning to be at home, ‘in Christ’, is surely the place where the discussion is headed. As the Son of Man had no place to lay his head, neither do we outside of the sheer nonesensical grace of God. If that is my perspective than the twins of ambition and boredom are dealt with and so is the fact that sometimes you gots to go too. Stability isn’t a promise this side of the eschaton (and even then, who knows?). I get the feeling that a failure to recognize the transience an instability of our life between Jesus’ resurrection and our own resurrection is a source of a lot of idealism in Christian literature.